Der Artikel JAG Season 1-10 (Complete Collection) (UK Import mit deutscher Tonspur) wurde in den Warenkorb gelegt. 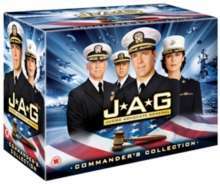 The complete seasons 1-10 of the US drama series. Former flying ace Harmon 'Harm' Rabb (David James Elliott) is a member of the Navy's Judge Advocate General. Now an attorney, Harm investigates, prosecutes and defends military criminals in cases that often take him behind enemy lines.